The hype of over en bloc sales in Singapore just keeps building as 5 projects have become the latest projects to hop on the collective sale bandwagon in this week alone. Top of the list would be the iconic Pearlbank Apartments at Outram – located just at the fringe of the Central Business District (CBD) was put up for collective sale for the 4th time, with a reserve price of S$728 million (or a land cost amount of approximately S$1,505 psf ppr), inclusive of a premium for the lease top-up of around S$195 million. The 99-year leasehold Pearlbank Apartments has a lease tenure of no more than 52 years left and has a total of 288 strata units (including 8 commercial) spreading across a single 37-storey tower. According to analysts, the owners of Pearlbank Apartments will each receive a minimum payout of between S$1.8 million to S$4.9 million and the future new launch at Outram may be able to yield 730 new private homes (with an average size of 800 square feet each). Meanwhile, other developments such as the 17-storey freehold Parkway Mansion is also making its 3rd attempt at an en bloc sale with a reserve price of S$138 million. With only 32 units in total presently, each owner is expected to be paid from S$4.2 million to S$4.4 million as sales proceeds, which will vary according to the sizes of their homes. Market watchers are expecting property developers who are interested in the Parkway Mansions en bloc tender to take reference from the recent massive Amber Park en bloc by CDL, as a guideline for their bid. Next up is Derby Court (new project will be named as Fyve Derbyshire) battling out to be part of the en bloc sales in Singapore – at a reserve price of S$62 million. It is a freehold apartment block with only 20 units, located near the Novena central and just next to the newly completed 6 Derbyshire condo. Another development up for collective sale is Riviera Point located along the River Valley Road stretch with only 33 units in total and is within close proximity to the latest new launch project, Martin Modern by GuocoLand. 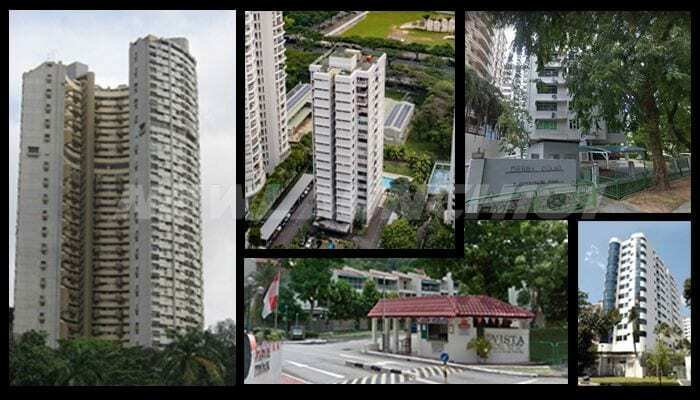 The Riviera Point en bloc has a reserve price of no less than S$75 million. The en bloc sales in Singapore just keeps getting hotter with Vista Park condominium rounding up the 5 projects which have been launched for tender this week. With a minimum reserve price of S$350, each owner is expected to pocket a lump sum of between $1.16 million – $3.5 million, which is more than 60% more of what they could fetch by selling their homes in the open market on their own. Vista Park condo, comprising of 209 private homes is just located at the fringe of Kent Ridge Park and within 6 to 7 minutes’ walk to the nearby Pasir Panjang MRT Station. Based on the land size of 319,250 square feet and a 1.4 gross plot ratio, the 99-year leasehold site (left with around 61 years) has the potential to yield about 530 new homes (with an average size of 800 square feet each). The premium for lease top-up is estimated around $66 million or a land rate of $932 psf ppr, which was mentioned to be comparable to the recent Normanton Park en bloc of $969 psf ppr, located within the same precinct.